Plastic bag manufacturers took a hit Wednesday as the Los Angeles City Council voted to ban single-use plastic bags at grocery stores and other retailers in the city. 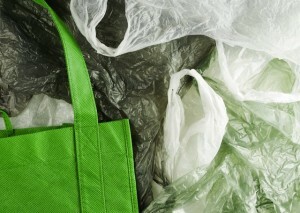 The motion approved 13-1 Wednesday gives large retailers six months and small retailers a year to phase out plastic bags. Retailers will then have a year before they must charge shoppers 10 cents each for paper bags. The council will have to vote on the measure again, likely this fall, after an environmental impact report. The American Progressive Bag Alliance, a trade group representing plastic bag makers, called the new Los Angeles policy “Draconian” and said it could lead to layoffs at bag companies, such as Crown Poly in Huntington Park. “By voting to ban plastic shopping bags, the City of Los Angeles put in motion a misguided and onerous policy that threatens the jobs of hundreds of Angelenos,” said Mark Daniels, a vice president at bag maker Hilex Poly Co. LLC in Hartsville, S.C., the nation’s largest bag maker. Daniels also called the 10-cent charge for paper bags a hidden tax. That’s the same argument the bag makers have used in fighting a similar ban in the unincorporated areas of Los Angeles County, though so far without success. A judge in March ruled against the industry’s claim that the bag charge in the county ordinance is a tax and therefore could only be approved by voters. The industry has appealed the ruling. Bag makers had watched the bag-ban push in Los Angeles closely, as the city is the largest in the United States to consider a ban. Mayor Antonio Villaraigosa, echoing an industry concern, issued a statement Wednesday saying he hopes the Los Angeles ban will encourage other cities to get rid of plastic bags.